Michelle Tilley has been working in the Games industry for 9 years. She can thank her brother’s for her love of console gaming and still enjoys a friendly debate on which is the better console (ahem… PS4). Growing up, she spent a lot of her time fighting for misunderstood villains in Dungeon Keeper – she maintains that Bullfrog are one of the greatest studios of all time - but truly fell in love with gaming when she discovered the Final Fantasy series and enjoys playing anything with amazing character-driven stories. Or flashy weapons. After leaving University with a BA Hons in English and Creative Writing, her gaming passion was realised when she was hired as a Games Tester. She loves coming to work everyday and sneaking people’s control pads to play the latest and greatest games. As well as being an ambassador for getting more women in games, Michelle also strives to encourage people from all walks of life to get involved with games and engage with the industry, and tries to help them understand the positive impact that games can truly have on lives. I’m a Senior Release Manager in Worldwide Studios Quality Assurance, Sony Interactive Entertainment Europe, working as part of the Global Release Management team on PlayStation exclusive products. It involves helping coordinate the release of games, patches, DLC and other types of products to the public, working in partnership with our studios and test teams. It is a challenging role, involving strategizing the release with various teams, project scheduling, risk management, reporting and negotiation. However, I’m currently seconded to our sister team, Tools and Test Engineering, where I am acting as a coordinator for a technical team designing in-house tools and automation frameworks for our titles. My role is aimed at focusing on communication and project managing. Besides that, I get to work on games I love and with the most creative and genuinely awesome people! I love coming into work each day inspired and ready to be challenged, in a good way of course! I started in the industry as a games tester, after finishing university with an English and Writing Degree (I know – how did I end up here?). It was a time when I felt lost, not knowing what to do with my life and naively I wrote down a list of dream jobs – one of which was a games tester, having fallen in love with games when I was a kid and discovered my brother’s SNES. I was lucky that PlayStation was hiring, a company I had grew up with and loved. Final Fantasy practically helped raised me! Since joining, I have had opportunities to work onsite at studios, travel the world and work on brilliant games. I was promoted and joined a really supportive and encouraging team. My management team really helped me grow and invested time developing me, as well as encouraging me to follow my passions. One of these included helping me get involved with PlayStation®First, which is Sony Interactive Entertainment’s Academic Development Program. Working with and inspiring the next generation of game developers (and gamers) is something that really resonates with me – I always loved games. I would set my alarm to go off at 6am in the morning, so I knew I would have enough time to invest some hours in whatever game I was playing that week before school or college. If someone would have talked to me about the amazing possibilities within the UK games industry when I was a young, I would have had an extremely different career path. Other than that, I struggle to platinum trophies in my games nowadays – more so due to time. Or that’s what I tell myself! I have been at PlayStation for nearly 9 years now and it has been an enjoyable and challenging journey. I was originally hired as a contract games tester and took every opportunity that I could. But if I’m being honest, part of the challenge was creating opportunities for myself – not being afraid to ask people for help or experience in certain areas and being visible and engaged with the company. Being good at your job is great, but if no one sees all your hard work or if you don’t engage with your company and colleagues, how are people going to measure your success? I had a great mentor, who really taught me about the value of branding yourself and how important it is in terms of making an impact, whether this is within the company or the industry. The biggest obstacle was my inner doubt – imposter syndrome and feeling like a fraud. A lot of people in the industry are so talented and sometimes I get hung-up on the fact that I am not artistic and can’t code, sometimes it’s difficult to feel like you have credibility. I love games and what I do, but I ask myself is that really enough to be successful in this industry? Last year I had the privilege to join Next Gen’s Aspiring Women course, which was a professional development programme designed for women in Games, Animation or VFX. I remember on our taster day feeling like a fraud sat in a room full of the most talented, brilliant women! Not to make this sound like I went on a dramatic vision quest or anything, but I really learned a lot about myself during the programme. And from it I became a more secure, confident person and this really developed due to be surrounding by such a supportive and, well badass women. As I mentioned, I’m currently in a secondment with a new team – so I’m still learning about the team and trying to understand their processes. They are a technical team, focused on creating tools to support our games, studios and the test teams that are working on them. I recently helped coordinate PlayStation to sponsor a Digital Bootcamp for young women aged 11- 14 years old. We partnered with an amazing group called the Liverpool Girl Geeks, who really to me embody the kind of positive role models we want in the games and tech industry. We hope that as a result, the bootcampers will consider a career in tech. We hosted one of the sessions here in our Liverpool office, were we gave the young women an overview of the UK Games industry, a tour of our cool office, a presentation of the PlayStation VR® journey and some live demos of our games. 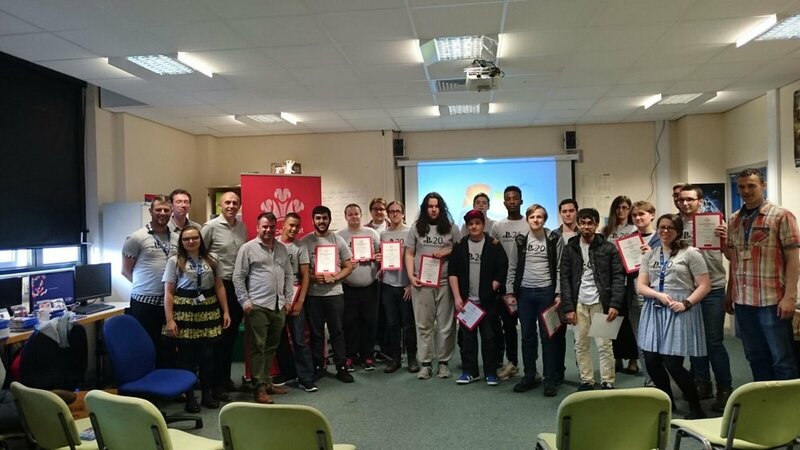 I will also be working on our Prince’s Trust Get Started with Games event in Liverpool this year, which gives young people from disadvantaged backgrounds their first taste of game development. I’m really excited to meet the young people and talk about all the opportunities that they have. In general, I think there’s a common misconception that you have to be a coder to succeed in the Games Industry or that you have to move abroad to join a successful studio. This just isn’t the case – there’s so much opportunity here, but it’s just a case of talking to young people about this. It’s really remarkable to see how much the young people grow and develop their confidence during the course! What does the #WomenInTech movement mean to you? What are the challenges of being an entrepreneur and woman in STEM industry? The Games Industry is a fun place to work and let’s face it, games are REALLY cool – I want our workforce to reflect this and be as diverse and unique as our games. At the moment, women are underrepresented in the tech industry. This movement is about empowering both men and women to actively work at attracting them to join, in order to help create a diverse workforce. There’s sometimes a fear when you talk to people about the gender imbalance, that you might either burn a bra in their face or the conversation might turn into man-hating. No-one wants that! What people want is to engage with women and encourage more of them to join the tech industry. Although it wasn’t specifically about women in tech, the HeForShe campaign which is led by Watson really resonated with me. Some of the biggest feminists and supporters of women I know are men, who want to work for a gender equal world and should their opinion be considered less because they aren’t a woman? Of course not. If you haven’t seen Emma Watson’s opening speech at the United Nations, please check it out. It's really important that we have these initiatives like STEM and Video Game Ambassadors in the UK. This encourages people like me in the industry to volunteer my time and connect with young people by sharing my experience and knowledge. I’m always hopeful it will inspire more young people to engage with STEM subjects. Last year I was nominated for an Unsung Hero award at the 2016 Women in Games awards. It wasn’t the nomination itself, but the fact that a lot of my colleagues and partners mailed me including why they nominated me. It was strange to see myself through their eyes and gave me a lot of self-validation. Plus, it’s always good to know you’re not doing a terrible job. I’ve recently been selected to be a Women In Games Ambassador, which I’m hugely grateful and excited about! One of my career highlights has definitely been working with the Liverpool Girl Geeks. I’m personally really interested in seeing what other possibilities that VR can bring to the industry. How will storytelling evolve from this? Separate to that, there’s always new, emerging technology that changes things. It’s almost a cliché, but games and the tools we use to make them just keep getting better and better. It’s a really exciting time to be working in the tech industry. In general, I would like to see more industry experts pair with our education system to collaborate in how to get the talent needed in our business. Can you name any prominent women in this industry that you admire? There’s so many talented women I get the chance to work with, especially in my office! It’s great to work in an environment where we can empower each other and I’ve made some of my best friends here! On a wider scale, there’s so many amazing women in the industry it’s difficult to know where to start! A few people who I really admire from the top of my head are Angie Smetts from Guerrilla Games, Siobhan Reddy from Media Molecule and Gina Jackson from Imaginarium Studios. Follow your passions and if you want to see a change, help be the change! Work damn hard, have the courage to ask for help or guidance when needed and don’t be ashamed of ambition. Remember to support your peers and celebrate their successes – we have a tendency to belittle our own achievements or resent other’s accomplishments. Don’t! You’re awesome and you should know that. And maybe your colleague, friend or boss needs to hear that sometimes too! Jessica Curry, The Chinese Room – she was the closing keynote speaker in last year’s European Women in Games Conference and she talked a lot about issues within the industry, not just the gender issue. It really resonated with me and I left feeling inspired and courageous. Maria Stukoff, Head of Digital, BBC Academy, BBC – Maria was my mentor /cheerleader whilst she was head of PlayStation®First. She was, and still is, a big inspiration – her strong worth ethic, drive and enthusiasm are second to none. She really motivated me to start challenging myself and not to be afraid of being ambitious and wanting to make a difference in our industry. This is a bit of a cheat, but all of the women who were part of my Next Gen Aspiring Women’s course. They are all so impressive and uniquely gifted – it actually makes me sick how talented they all are! But seriously, they are a group of supportive and professional women. When I had a career setback, they were able to help pick me up when I felt like “What’s the point?”. Having that support network really helped me bounce back and ready to overcome the obstacle. Connect with Michelle on LinkedIn here!